Oklahoma is the first musical written by composer Richard Rodgers (http://en NULL.wikipedia NULL.org/wiki/Richard_Rodgers) and librettist Oscar Hammerstein II (http://en NULL.wikipedia NULL.org/wiki/Oscar_Hammerstein_II). The musical is based on Lynn Riggs (http://en NULL.wikipedia NULL.org/wiki/Lynn_Riggs)‘ 1931 play, Green Grow the Lilacs. The original Broadway production opened on March 31, 1943. RLOP first performed Oklahoma! 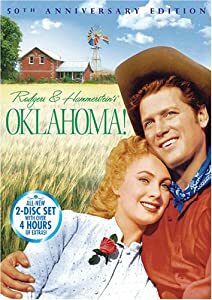 (http://en NULL.wikipedia NULL.org/wiki/Oklahoma%21_%28film%29) in 1971. They performed it again in 1988 and 2004.